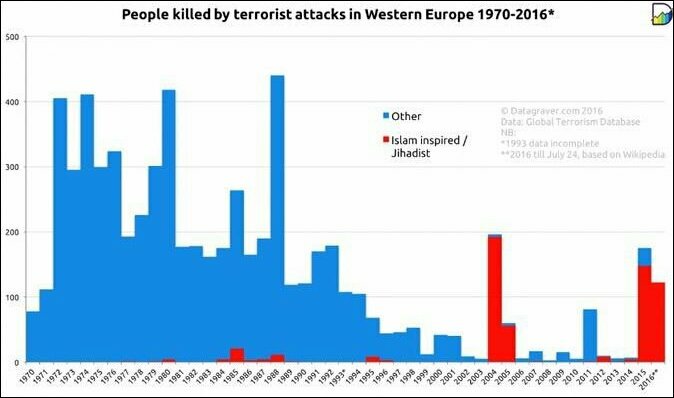 The reaction to individual terrorist incidents as an excuse to ban, attack or demonize an entire faith is all out of proportion to the history of Terrorism in Europe. Here's the data. Acts of Terror require a measured, proportional response. We can't recall British media demanding Spaniards, Irish, Italians or Germans all bewing banned from the UK because of the acts of the IRA, ETA, Red Brigade or Baader-Meinhof.